Astroboffins have spotted a real-universe analogue of Doctor Who's Time Lord home world Gallifrey - or alternatively the luxury-planet-builders' planet Magrathea of Hitchhikers' Guide to the Galaxy fame - spinning in space around twin suns. And one of them is in a sweet spot distance from its stars to allow life to inhabit it. 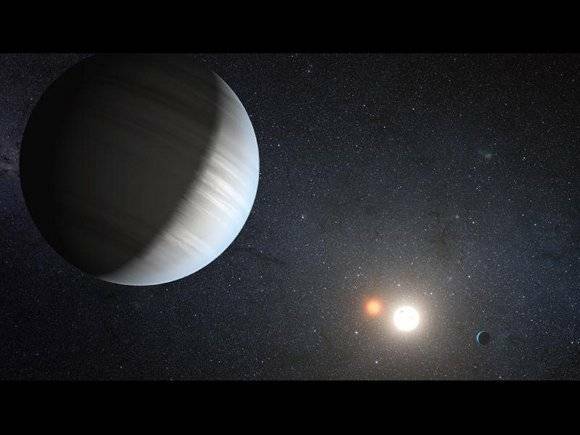 NASA's planet-hunting space telescope Kepler has found what scientists call a "transiting circumbinary multi-planet system" - two worlds orbiting two suns. The spacecraft had found a Tatooine-style world - one planet orbiting two suns as seen in Star Wars last year - but this is the first time a multi-planet system around a pair of stars has been seen. The discovery shows that worlds can form and survive in the chaotic environment around two suns. "Each planet transits over the primary star, giving unambiguous evidence that the planets are real," Jerome Orosz, associate professor of astronomy at San Diego State University and lead author of the latest Kepler study, said. The system, named Kepler 47, has two stars circling each other every 7.5 days, one of which is similar to our Sun. The other is a much smaller star - a third of the size of Earth's sun - and many times fainter. Of the two planets, the inner one - dubbed Kepler-47b - is three times the size of our world, making it the smallest known transiting circumbinary planet, and it orbits the stars every 49 days. The second planet, Kepler-47c, lies in the habitable zone around the suns, meaning there could be water and/or Gallifreyans on it. However, the planet is likely to be a gas giant and so not suitable for our kind of life, but two-hearted Time Lords could doubtless cope with it, or perhaps live on moons in orbit around the giant. "The thing I find most exciting," said Welsh, "is the potential for habitability in a circumbinary system. Kepler-47c is not likely to harbour life, but if it had large moons, those would be very interesting worlds." 47c is just slightly larger than Uranus and circles its stars every 303 days, making it the longest transiting planet currently known. The whole system lies about 5,000 lightyears away in the constellation Cygnus. *Or Tatooine from Star Wars if you really must.